Story: Lynx was the leader of the Jakarra, seeking revenge for the former king Khylunds transgression with a human female. Fearing that the rightful heir to the throne, Cougar, would one day come to claim the throne, she kidnapped Cougars mother to lure him to the Congo Basin. In the following battle with Cougar, she lost the leadership of the Jakarra [2,3]. 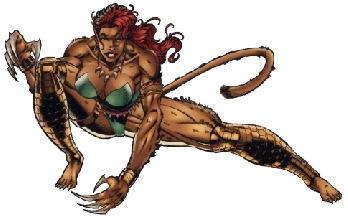 Skills & abilities: Lynx has the cat-like abilities inherent in her race i.e. extendable claws and an expert hunter/tracker . Kero Padjyr: Another human/feline character; from Dark Ocean Studios. Leeyal: Another human/feline character; from Dark Ocean Studios.